Thanks to sushil singh for introducing the following information. Holi is one of the major festival of India and is the most vibrant of all. The festival is filled with so much fun and frolic that the very mention of the word 'Holi' draws smile and enthusiasm amongst the people. Holi also celebrates the arrival of Spring, a season of joy and hope. In North India, Holi is related to the life of Lord Krishna. He spent most of his childhood in Mathura and Vrindavana and it is believed that he was the one who introduced the modern form of Holi and thus it is celebrated with great enthusiasm at these places for about a week. Both the places are situated in Uttar Pradesh where temples, dedicated to Krishna and Radha, are amazingly decorated during the celebration of Holi. The festival is celebrated by getting drenched with colored water and is considered auspicious. Since Radha belonged to Barsana while Krishna belonged to Nandagaon, on the day of Holi, men from Nandagaon go to Barsana to celebrate Holi with the women there. The playful teasing of women and attempts to color them with 'gulal' and wet colors from 'pichkari' is returned by them by attempts to escape and beating the men with sticks to scamper them away. In Bengal, Holi is called Dol Yatra (the Swing Festival) in which idols of Krishna and Radha are placed on swings and devotees take turns to swing them. 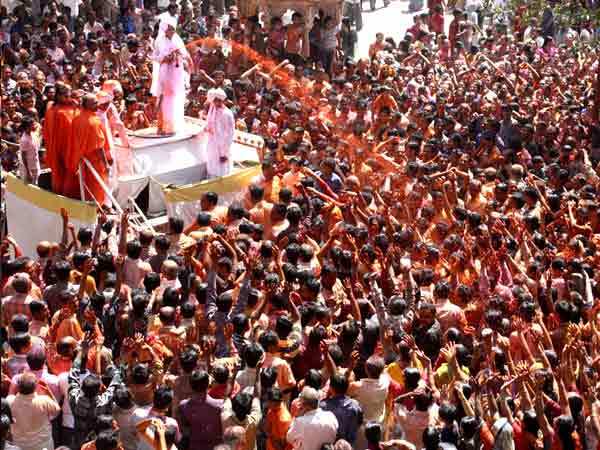 Women perform devotional songs and dances around the swing as men spray colored water and 'Abeer' (colored powder) on them. Orissa has similar traditions as Bengal except for the fact that the idols of Jagannath is placed on the swing here instead of Krishna and Radha, who is believed to be another form of Krishna. Holi is celebrated with the same fervour and charm in Bihar as in rest of north India.Here too, the legend of Holika is prevalent. On the eve of Phalgun Poornima, people light bonfires. They put dung cakes, wood of Araad or Redi tree and Holika tree, grains from the fresh harvest and unwanted wood leaves in the bonfire. Following the tradition people also clean their houses for the day. Children and the youth take extreme delight in the festival. Though the festival is usually played with colours at some places people also enjoy playing holi with mud. Folk songs are sung at high pitch and people dance to the tune of dholak and the spirit of Holi. Intoxicating bhang is consumed with a variety of mouth watering delicacies such as pakoras and thandai to enhance the mood of the festival. Delhi being the capital and the heart of India, celebrates Holi with extreme enthusiasm. Being a metro city, an amalgamation of cultures and traditions can be witnessed here. Virtually all aspects of Holi as seen in various states are noticeable in the numerous pockets of Delhi. People move out in tolis and apply colour on each other till they become unrecognizable. Play with colors peaks up in the residential colonies as people usually do not go out with families beyond their neighborhood. Even public conveyances do no ply with usual frequency. Feasts, music, dancing and blasting parties are held all over the city to mark the festival of colours. People hug and greet each other by applying abeer as tilak. Any feeling of hardship or animosity is forgotten on the day. Is is said that even the enemies become friend on Holi. On the eve of Holi, bonfires or Holika are lit in the important centres of the city where people celebrate the victory of good over evil. Wood for burning Holika is collected weeks before the festival. Being a political hub of the country, Delhi sees huge enthusiasm even among the politicians. Holi is also celebrated at the Presidents and Prime Minister residences where people gather to play Holi. Cultural events and lots of fun mark the day. The vibrant Gujarat reverberates with the chants of the folk song-'Govinda ala re, zara matki sambhal Brijbala..'. People, specially the youth of the state are high on the spirit of the festival. So much energy can be seen amongst the boys and girls of this state as they move in processions 'tolis'. Drenched in coloured waters boys cheerfully warn people to take care of their pots of butter and milk. The tradition has its origin from the legend of Lord Krishna who was known to steal butter and milk from any accessible house in his village. The state is famous for the tradition of breaking earthen pot full of buttermilk and tied high on a rope. Hundreds of people participate in forming a human pyramid, in order to reach the pot. At places, there are also prizes for the group which successfully breaks the pot. The person who actually breaks the pot is crowned the 'Holi King' of the locality for the year. Participation of the onlookers is no less. They keep throwing buckets of water on the boys forming the pyramid. Although the Holi Festival originated in India, it has emigrated all over the world. it was celebrated in the New York City borough of Queens, where I live. An estimated 20,000 people participated in the celebration. Here it is an Indo-Carribean festival, also known as Phagwah. Queens is home to many people whose roots go back to Trinidad, Surinam and Guyana, and before that to India. "Festival participants throw colored powder known as 'abrac' on each other to celebrate the approaching spring season and to chase away the winter grays. Festival-goers normally wear all white and throw bright pink, green and blue dyes and powders." Holi is one of the most important festivals in India. ... 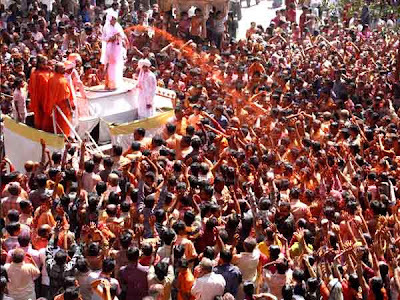 The Holi of Mathura and Vridavan is extremely famous throughout the country. It is said that the tradition of playing colors on Holi originated from the ‘leela’ of Radha and Krishna. As Krishna was always jealous of Radha's fair complexion, he teasingly colored Radha's face with color. In a mischievous mood, Radha also ran behind him badly annoyed and shouting. This was how the tradition of applying color came in being and is religiously followed till date. People of Mathura and Vridavan associate Holi with the divine love of Krishna and Radha. According to mythological records, it is said that Mathura is actually the birth place of Lord Krishna, whereas Vrindavan is the place where he spent the early days of his childhood and left behind tales of mysticism and divinity. This explains the enigma of Mathura Vrindavan, where one can still feel the divine presence of the Lord. This is the place where Lord Krishna introduced the modern form of Holi. This is the reason that Holi is celebrated with great zeal here. Thousands of people visit the place, in search of peace, every year. The Holi celebrations present another reason for the admirers of the Lord to assemble at Mathura Vrindavan. They come to be a part of the colorful amalgamation of festivity and divinity. The main aim behind the festival of Holi is to rejoice in the love and devotion for the Supreme Being. The color and water washes away all the man made distinctions based on caste, creed, and other differences created by the society. Holy here is spiritually enlightening. The celebrations of the festival go on for about a week in Mathura Vrindavan. One of the unique features of the festival here is that different temples of Lord Krishna celebrate Holi on different days. It is interesting as well as amazing, to watch devotees at the Banke-Bihari Temple of Vrindavan. The environment is filled with a unique thrill, with people passionately chanting the name of Lord Krishna and Radha. Interesting celebrations also takes place at Gulal-Kund in Braj where boys mock Krishna leela on the day of Holi. People share cheelam and say "Shiv Shambho" near various Shiva temples under Banyan trees normally . Charas [ Hashish] is considered to be Shiv Bhutti [ "jo cheez Shiv ko priyankar hai" [That which is dear to Shiva ] ~ A north Indian cha'walla's definition. It is also called "Shiva Mooli" [ The Herb Of Shiva ] Shiva Jata [ The matted Locks Of Shiva ] in most Indian Languages including Sanskrit and Tamizh ~ Ganga and charas [ from the species Cannabis Indica] have been used in india from times immemorial especially by the Shaivites and Taantriks ~ . Holi is great festival perhaps inviting the Spring on earth. It is celebrated all over India. It symbolises the struggle between the evil and good, where virtue triumphs. We wish Happy Holi to our friends all over the world, in Japan in particular. The color used to play Holi in ancient India was extracted from Tesu flowers which bloom during the spring season. It is believed that Lord Krishna played Holi with Radha using colors made from Tesu flowers. Even today many of the temples in Vrindavan, Braj area and Mathura play Holi with traditional yellowish-orange coloured water extracted from dried Tesu Flowers. Phagwa is celebrated on the first day of the full moon in the month of Phagun (February to early March). It came to Trinidad and Tobago with the arrival of Indian indentureship in 1845.